Good morning friends! 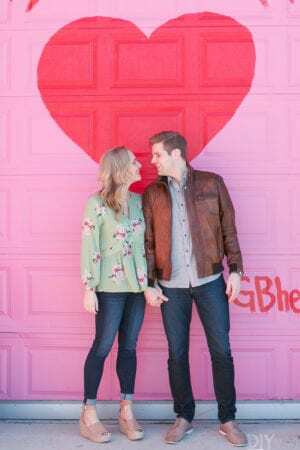 Since it’s now February (crazy!! 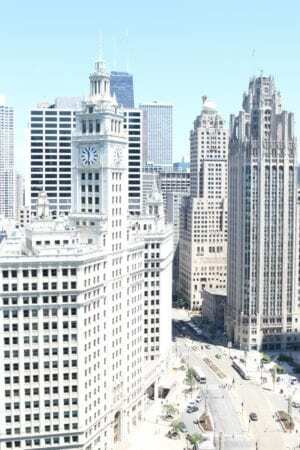 ), we are kicking the month off with a craft that we L-O-V-E. 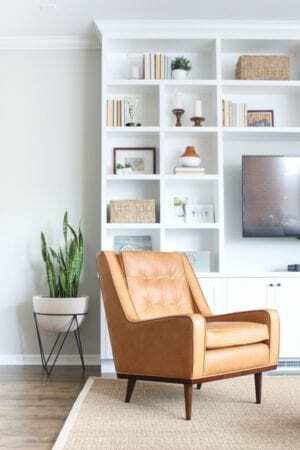 This super easy piece of home decor will add instant glam to ANY space without breaking the bank. And the best part?! 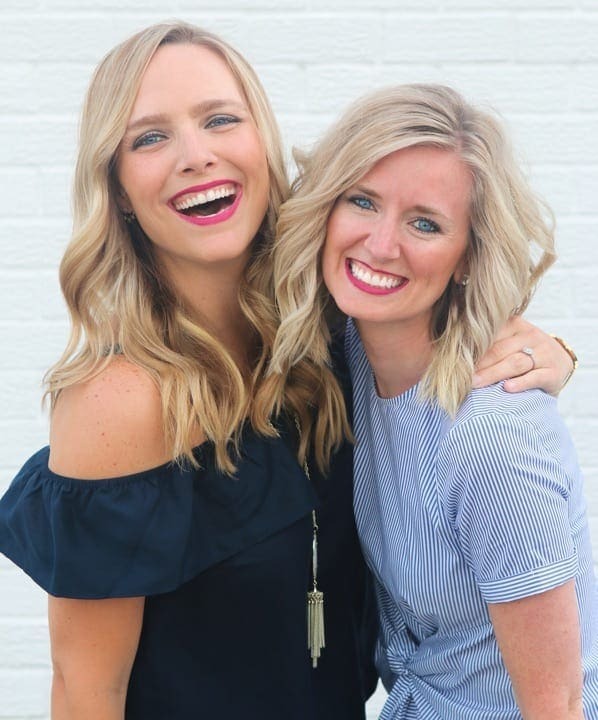 We are pretty darn confident that this DIY would be amazing paired with your favorite girlfriends & wine at your next Girls’ Night In! 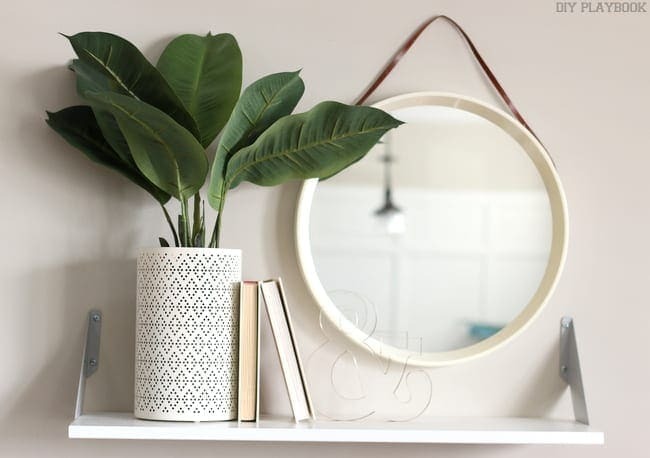 Lucite furniture and decor is all the rage these days; it’s a transparent, solid plastic and feels glam, while instantly making any space feel a little less cluttered. 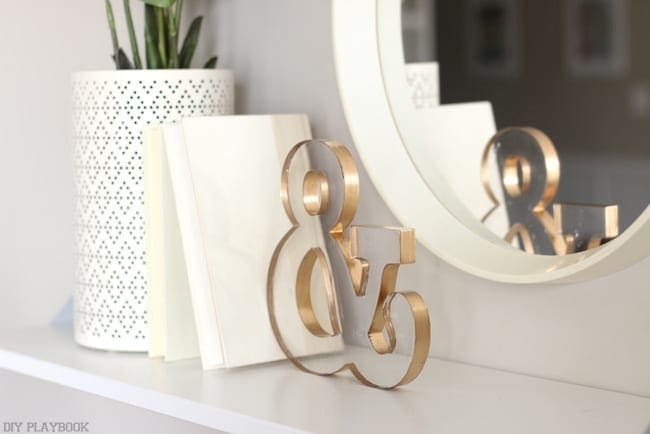 When we saw these Lucite letters in the Make Market section at Michaels, we KNEW we had to use them for our February Michael’s Makers challenge. And with a price tag of $14.99 ($7.50 with a 50% coupon), how could we go wrong?! 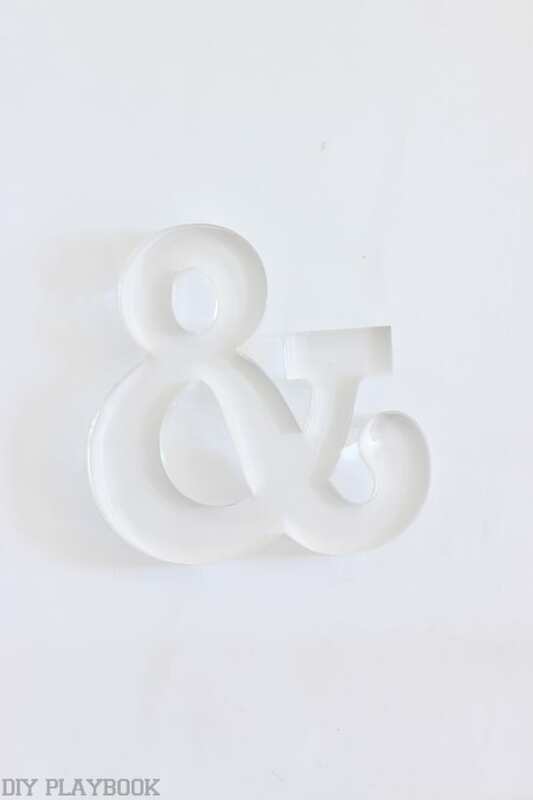 But as you notice from the before and after picture of this ampersand, a little color on these lucite letters can make an already glamorous piece even more gorgeous! 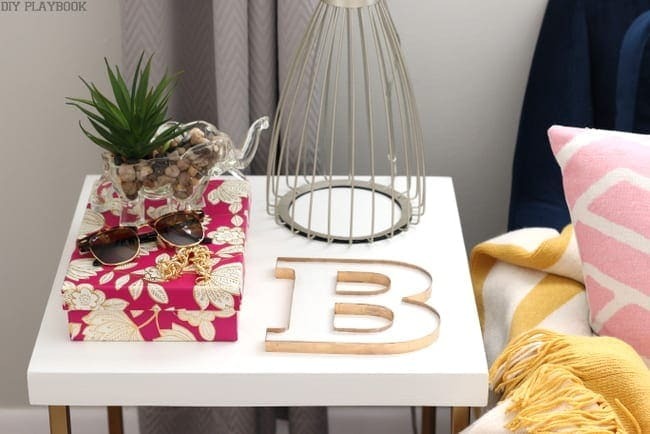 After you buy your letters, be careful transporting them back home…. you don’t want them to get scratched! 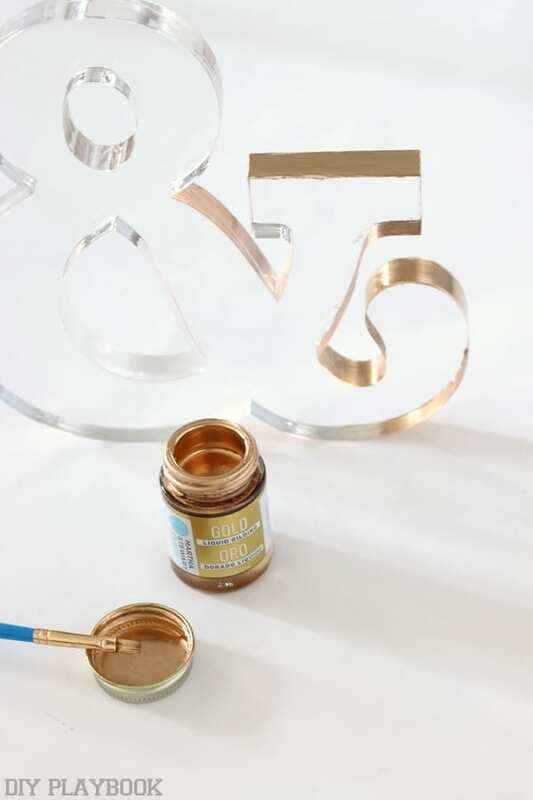 If you use acrylic paint to paint these letters a color other than gold (we have an example of this later in the post), stick with the DARKER acrylic paints to ensure the paint will cover thoroughly. 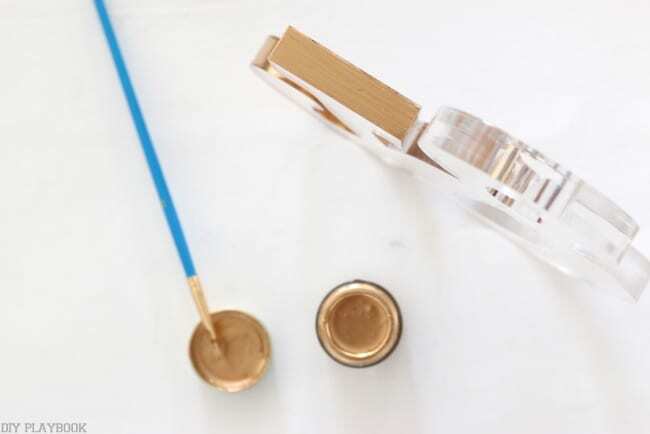 We tried regular acrylic gold paint and it was too light to cover. 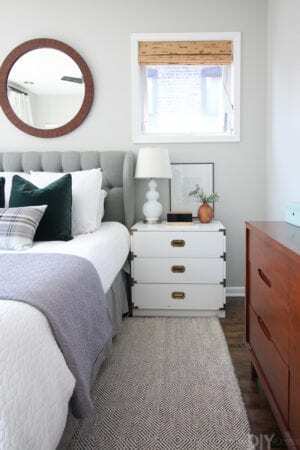 Soft bristled paint brushes are a MUST when dealing with both of these paints. 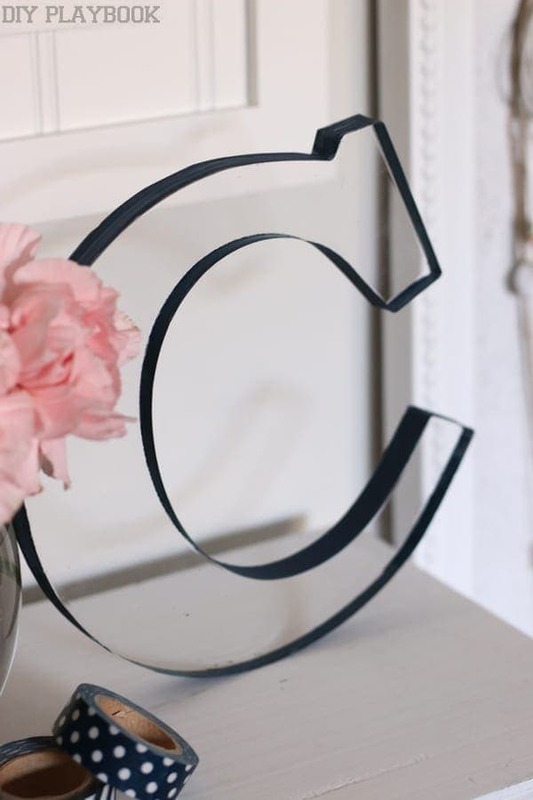 If you do host a Girls’ Night using this craft, it would be far more cost-effective to only buy a few colors for everyone to share…you only need a teeny-tiny amount of paint to cover each letter. Put newspaper down on the table where the paint is happening <– the liquid gold is not very forgiving. 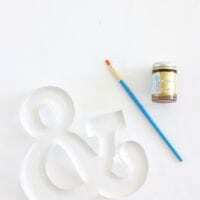 Once you have your supplies, all that’s left to do is carefully paint the edging of this letter. We found that the technique you paint the edge of this letter is very similar to painting your nails. It’s a tad tedious but not impossible. 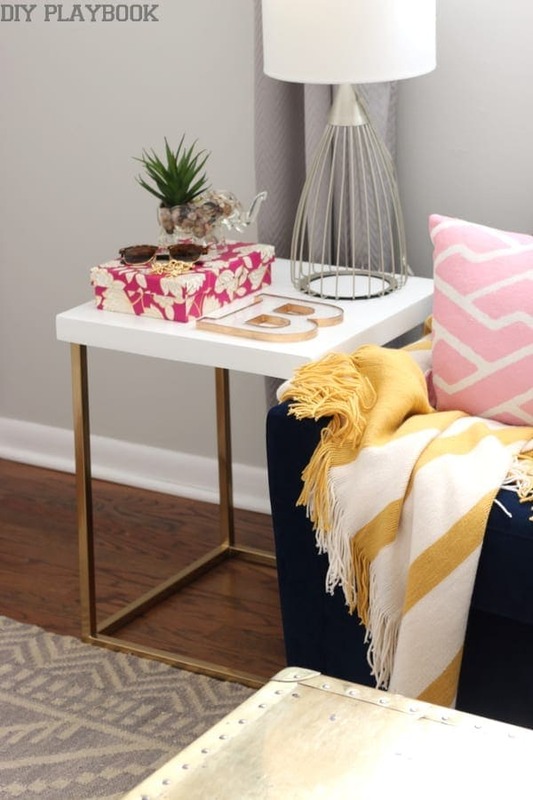 The soft bristled paint brush and the paint consistency is also similar to nail polish so if you’re good at painting your nails… you’ll be awesome at this project! Little by little you work your way around the letter until the entire border is painted. Acrylic paint and the liquid gold dry pretty quickly, so if you have to do two coats or wait until one side dries until you tackle the other, you can definitely get this all done in one sitting. For the gold, we only used one layer of paint and went back to touch up a few places that needed it. The navy letter (stay tuned) took two coats because the acrylic paint isn’t as thick as the liquid gold. 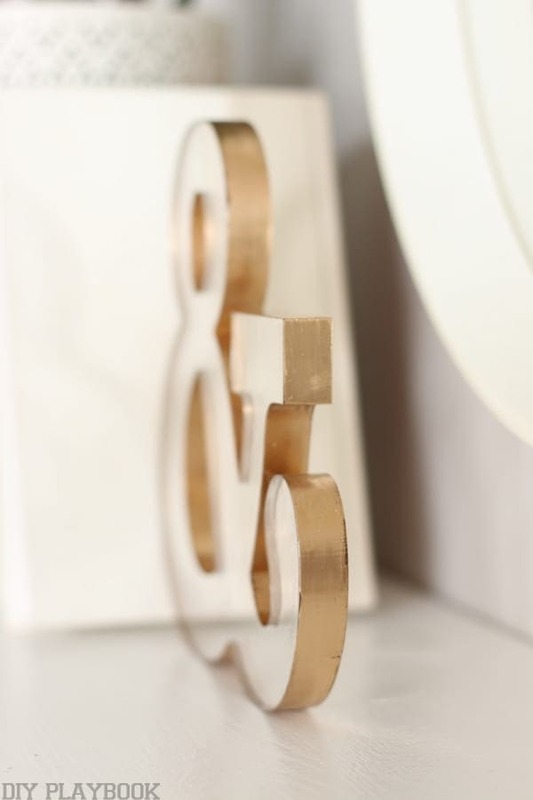 About an hour later, the gold ampersand was done and ready to add some serious GLAM to just about any space. 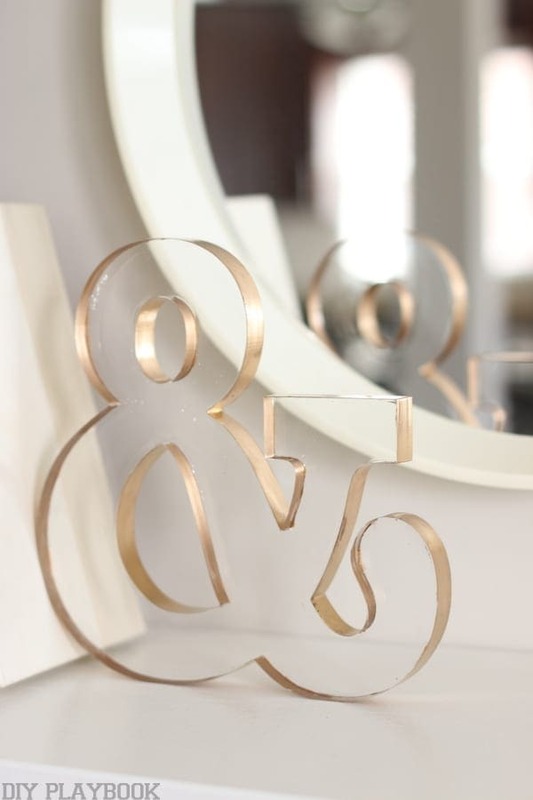 #veryversatile B added the lucite ampersand to her entryway shelf and instantly we were in LOVE! The cool part of this project is that when you look at the Lucite letter from straight on it still appears to be pure lucite. But when you look at it from any different perspective, you see the hints of gold. 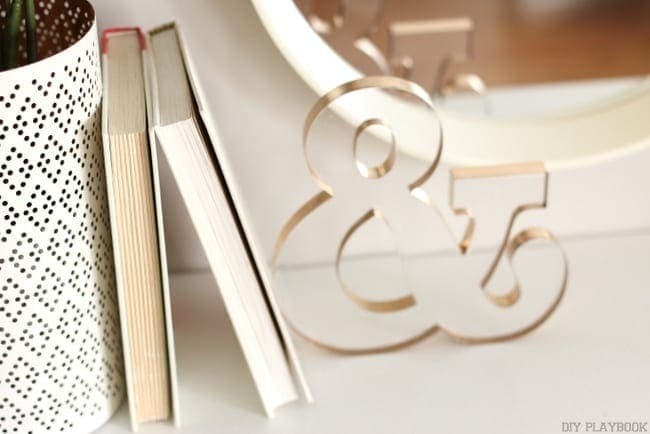 You can use one (or two) of these letters as bookends, but we loved the idea of these DIY Lucite Letters so much that we thought it would be fun to make a few more. 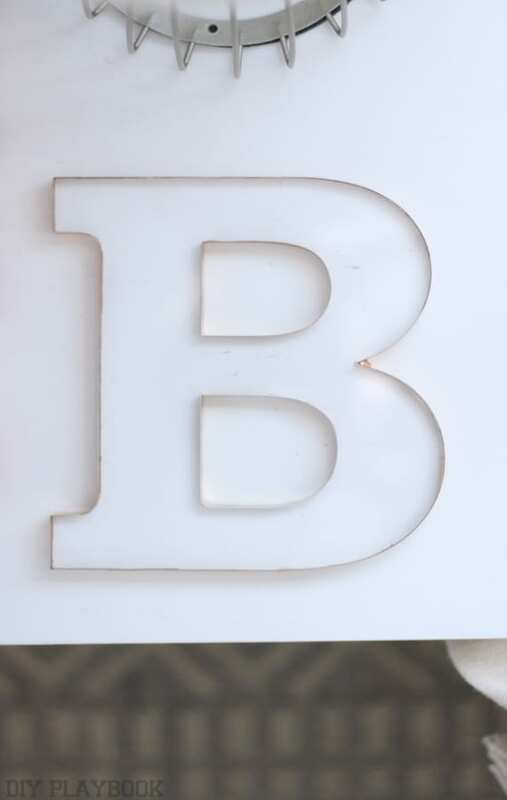 Bridget created a B, again using the liquid gold, and just placed it flat on a side table in her office. 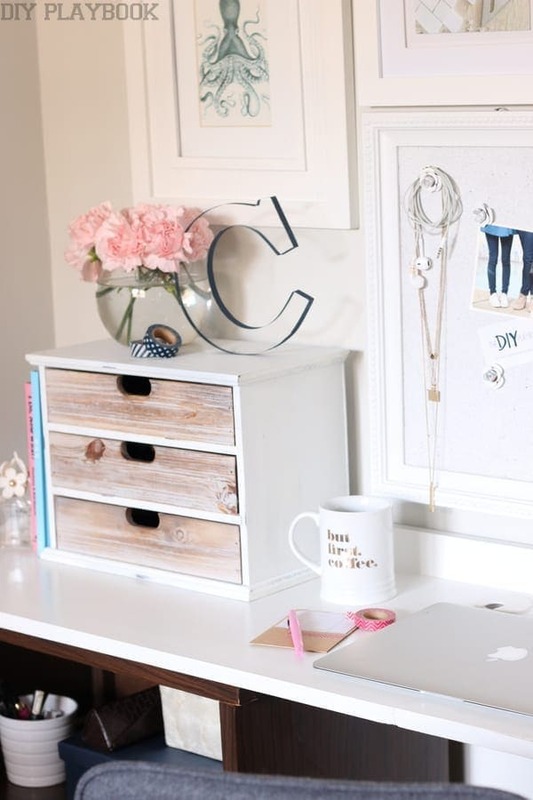 This idea could be cute on a coffee table or a desk too. 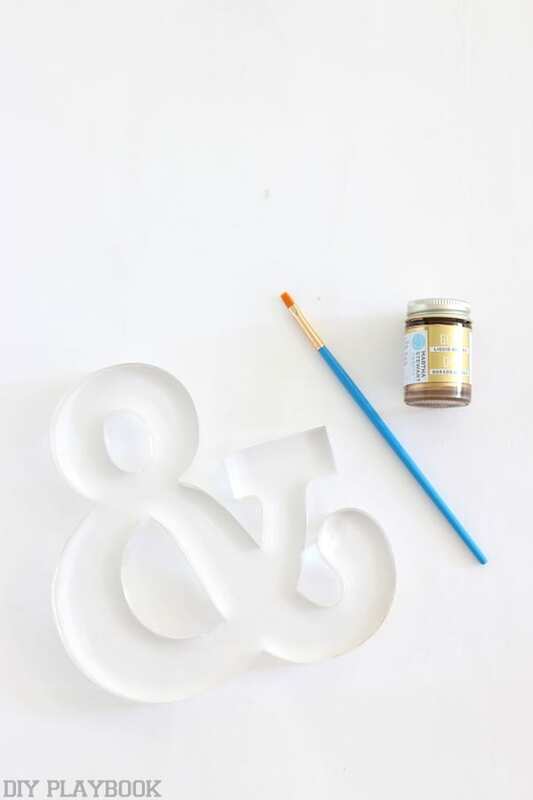 Rookie Tip: If you’re not a perfect painter and some of your paint gets onto the surface of your letter and doesn’t stay on the edges, it’s easy to remove these areas of acrylic paint once it dries. 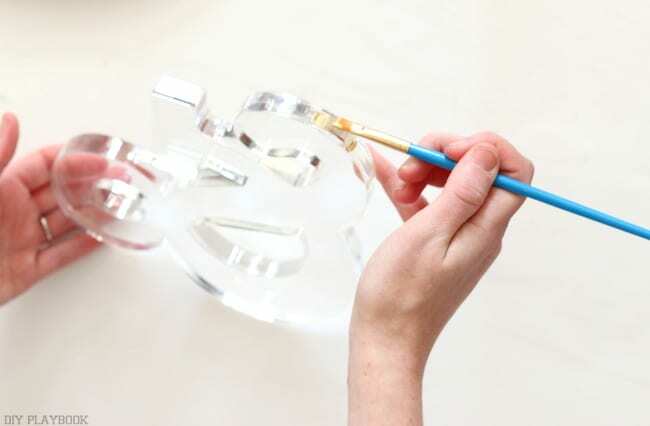 Simply allow all of the paint to dry and carefully scrape it off with your fingernail (trying not to scratch the lucite). The gold acrylic is a tad more tedious but not impossible to remove. In that case, we used just a hint of nail polish remover, a q-tip, and some muscle. You have to work at it a little harder, but we promise the liquid gold will eventually rub off. 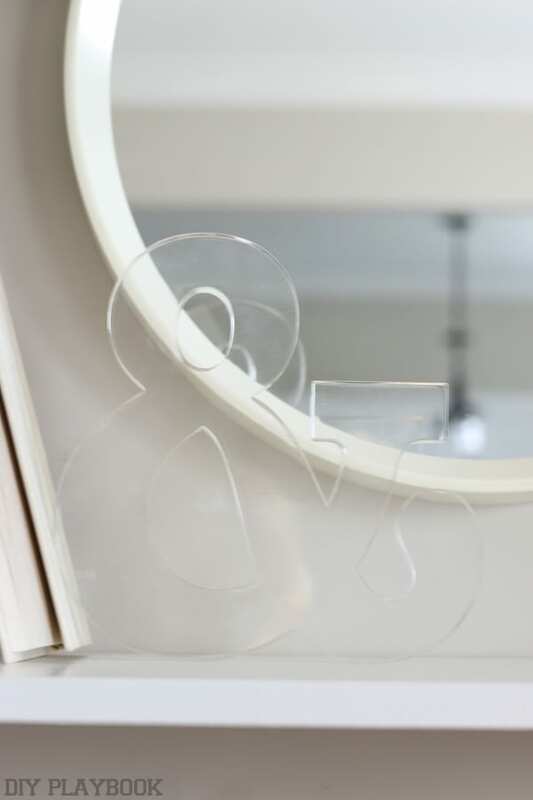 So what do you think… are you in love with the lucite letter as much as we are?! 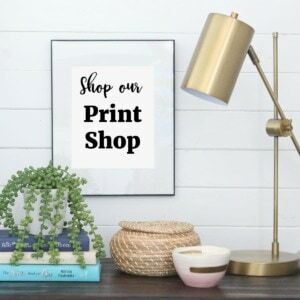 We can see them placed in a kitchen spelling out EAT, incorporated into a little girl’s glam nursery, incorporated into wedding decor, or even just the perfect new piece on your fav shelfie. 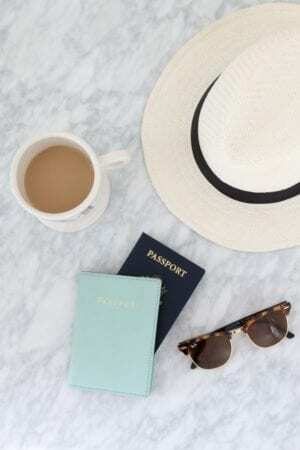 However you use these, will you promise us ONE thing?! 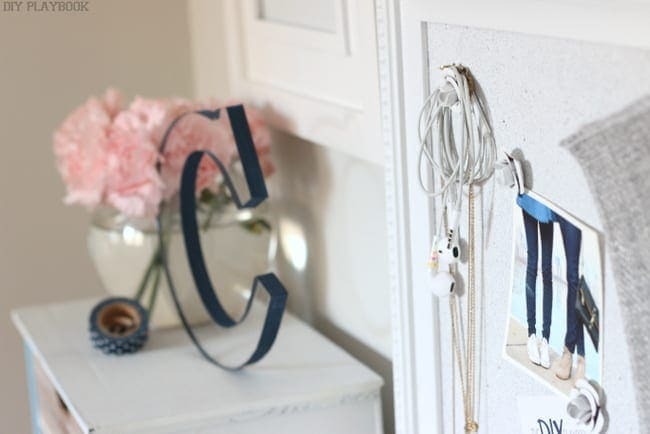 If you do have a Girls’ Night making these DIY Lucite Letters… promise to send us pictures!